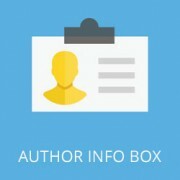 Do you want to add an author bio box in your WordPress posts? The author bio box is a small section where you can display information about the post author with links to their website and social profiles. In this article, we will show how to add an author info box in WordPress. Seeing an actual person behind the content helps build credibility and strengthens your site’s authority among users. For single author websites, you can just add an about me page. 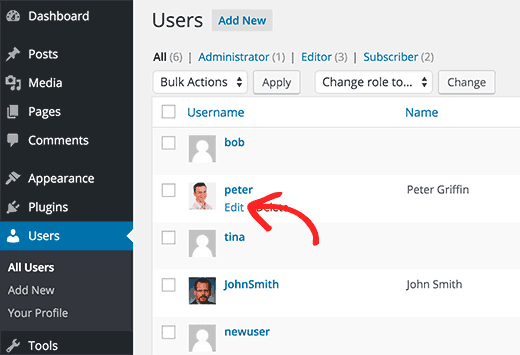 But for a multi-author WordPress sites, you will need to add an author info box below each post. The author box encourages authors to interact with readers. It provides an additional incentive to authors to build their own following. If you accept guest posts from other bloggers on your website, then an author info box will help you gain more traction on your site. Having said that, let’s take a look at how to easily add an author info box in WordPress posts. To make it easy, we have created a video tutorial on how to add an author info box that you can watch below. However if you just want to follow text-instructions, then you can follow our step by step tutorial on how to how to add an author info box in WordPress. There are many different ways that you can use to add an author info section. We will show you a two different plugins as well as the code method. This way you can choose a method that works best for your site. Most site owners want to display author information at the end of a post. 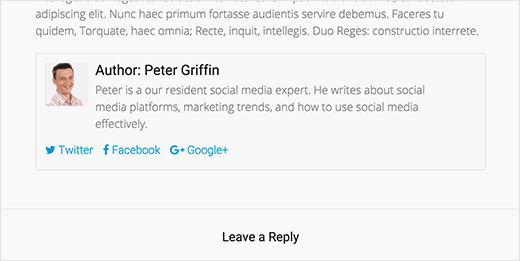 Here is how you can easily display an author info box at the end of WordPress posts. First thing you need to do is install and activate the Guerrilla’s Author Box plugin. For more details, see our step by step guide on how to install a WordPress plugin. Each author on your site will need to add their biographical information and links to their user profiles. They can do this by logging in to their WordPress account on your website and then click on the Profile link from the WordPress admin menu. As a site administrator, you can also fill in this information yourself by editing each user’s profile. You will need to visit Users » All User page, and then click on the edit link below the user you want to edit. You can now visit any WordPress post on your site, and you will see the author info box below the post. The plugin uses the default WordPress avatar system, called Gravatar. Your authors will need to add their photo on Gravatar website. For more information take a look at our guide about Gravatar, and why you should start using it right away. Guerrilla’s Author Box plugin comes with very basic CSS. It inherits the link and text colors from your WordPress theme. However, if you want to customize it, and you are comfortable working with CSS, then you can copy the plugin’s default CSS and paste it in your theme or child theme‘s stylesheet. Here is a sample CSS that you can use as a starting point. We have changed the background color and made the author photo round instead of square. This is how author info box looked on our demo website after applying this CSS. Yours may look slightly different depending on the fonts and colors used by your WordPress theme. The above method is great if you wanted to display the author info below posts. However, some of you may want to display author bio in the sidebar or any widget ready area. Here is how you can display author info in a sidebar widget. First thing you need to do is install and activate Meks Smart Author Widget plugin. Upon activation, you need to visit Appearance » Widgets page. There you will find Meks Smart Author under the list of available widgets. Add this widget to the sidebar where you want to display the author information. The widget comes with a number of options. Most important option that you need to check is the checkbox next to ‘Automatically detect author’ option. Click on the save button to store your widget settings. You can now visit your website to see the author information widget in action. This plugin also fetches user information from their WordPress profile. Your authors will need to fill their biographical information. Both methods described above rely on plugins. If for some reason you need to add author info box manually, then here is how you can do it. First you need to add this code to your theme’s functions.php file or a site-specific plugin. This code simply fetches the author information and displays it below WordPress posts. You need to style this author info box so that it looks nice and matches your WordPress theme. You can use this CSS into your theme or child theme’s stylesheet. Feel free to modify it to meet your needs. This is how the author info box looked on our demo site. We hope this article helped you add author info box in WordPress posts. You may also want to see our guide on how to add or remove capabilities to user roles in WordPress. Is there anyway to disable to author box for profiles which don’t have any info in the author bio? We use a custom field to add authorship to guest posts, and we don’t have a bio for most of our guests, and the blank box at the bottom of the page is z bit of an eyesore for these posts. Does this mean I have to give them user access???? This doesn’t make sense for me? THey’re random people? 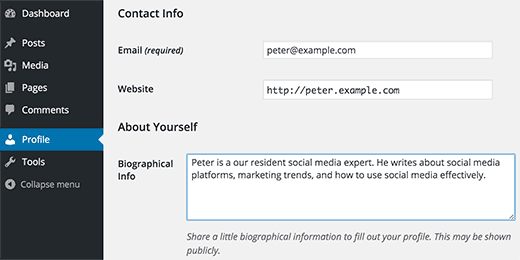 re: Each author on your site will need to add their biographical information and links to their user profiles. They can do this by logging in to their WordPress account on your website and then click on the Profile link from the WordPress admin menu. Random people should not have access to your WordPress site. 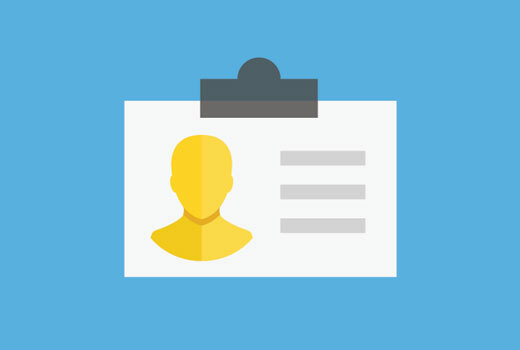 Please see our beginner’s guide about WordPress user roles and permissions. How to add EDD vendor name in EDD receipt? It seems in this case I need to hook this, BUT HOW? Thanks for this which is what I was looking for. Although now I see it with the bio in 2 places, what I would like is that the bio at the end of each post different to the bio down the side. Is this possible or do I have to remove Meks and replace it with some other plugin? This was just what I was looking for. I think I will stick with installing a plug-in though. Coding makes my head hurt. Thanks for the great wordpress content! hahaha! I thought exactly the same thing while reading through the post. Why go through the stress of coding, when there’s a plugin to get the job done? Hi, I was wondering how I can add a margin higher than my box using the code that you left us. My box shows very close to the letters of my post, I hope your answer. i don’t understand what is the issue! If I use method 3, it only shows the author info box when viewing a post. The post itself doesn´t show at all. Please how can I add the author box to specific categories only? You may have found the answer for this already (it’s kind of disappointing someone makes this posts and doesn’t respond to the questions), but I used this to display the box on only certain categories. Change “X” to the category ID. Hi. I am facing a problem while adding hyperlink in the author bio. I tried add hyper link using anchor text at edumovlive.com but failed. Can anyone help me to get hyperlink in author bio. , how can i print each user gravatar, by user id, inside this column? that links each image to each post via edit link, is there a way to add gravatar column in all users that links to edit user? How can I add links to my posts within the author box? Thanks for the post, great help. Is it possible to make the author box interactive? Like the bottom of this page? I would like something similar to the ‘as well as’ feature but I know nothing about CSS. I added author box using method 3 but it showing author box above sharing icons how to move this down near comment section?? Do I need add links to social media profiles to the author, any idea? For method #3 which is really the simplest and the fastest (involves some php coding skills) I added a break tag on the line where it shows picture and text as follows. Because it looks odd when only the first line of the bio shows up next to the picture and the rest of the bio separately. The hard coding worked perfectly with a little style tweaking, many thanks! under the // Get author’s biographical information or description is the some kind of way to control the word or character count without having to edit the user bio itself? Maybe similar to controlling the excerpt length on a post page in functions? I dont know how to add codes via my functions.php i might get an error. Any plugin to add codes into functions.php? You have to add it after the closing php tag that looks like this ( ?> ) in you child theme’s functions.php file. Hi. I have three sites. For some reason, my author box automatically shows up on one of them. I had to install the Guerilla plugin to get it to show up on the others. Why would one site show it and not the other two??? Hey There, Great article. The video attached to the post is not for instructions on “how to install a plugin” as written above it. Hi there, having trouble with the picture for the author box. I’ve moved the author widget to the sidebar for it to appear and it has along with the text but scratching my head on what to do to get the picture to show up also. I’m using a WordPress theme. Thanks for all your help! Heya… dealing with this today. Theme has a nice author box, but missing the socials at bottom. Love your roll your own example, which we’re messing with “right now” — any chance you might expand on the example to include pulling in the “if socials” from the user meta, below the author’s website link ? Did you ever figure this out Christopher? I’m having the same issue with my theme. Hi, thanks for this! I’m having a lot of help from you guys! For this and other functions. One question: How can I set the max lenght in the Author description. Also, can I use a custom text for the box description in the single page and a full description in the Author page? It can show the web page well upon browsed on desktop computer, left hand side is content, and right hand side show picture. Is it possible to show text first, and the picture under the text not around the picture? Please try to help me out. You may want to add a widget area right next to the content.